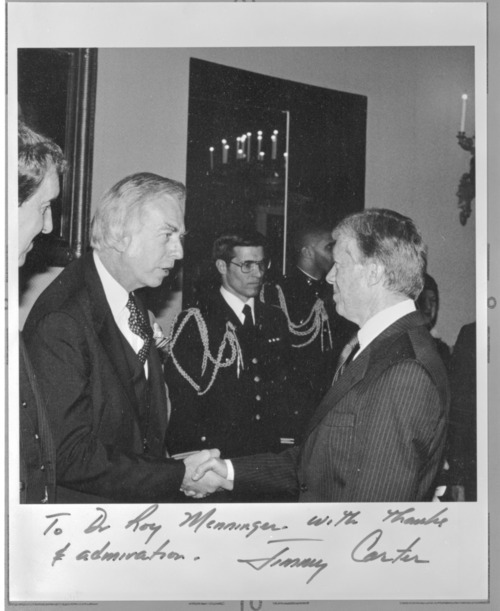 President of the United States Jimmy Carter is meeting with Roy Menninger, M.D., of the Menninger Foundation. The third generation of the Menninger family to enter psychiatry, Dr. Roy W. Menninger was president of the Menninger Foundation from 1967 to 1993. He joined the Foundation staff in 1961. Before his election as the Foundation's fourth president, he was director of the Department of Preventive Psychiatry. His special interests are in social and community psychiatry and mental health programs in schools.